Centenary upper-class students returned to classes today, marking the official start of the 2014 fall term as the College opens its 190th academic year. Members of this first-year class have been across the Atlantic and taken their first finals before most of their peers around the country have even started college. Centenary upper-class students returned to classes today, marking the official start of the 2014 fall term as the College opens its 190th academic year. Returning students are using the opportunity to meet members of the incoming class who have just completed the College’s inaugural August immersive term, including the ten-day Centenary in Paris program. The first-year students continued their orientation to campus after their return from Paris, participating in a water-themed field day, back to school dance, a magic show, and the annual taste fest sponsored by local restaurants. Informational sessions covered technology, safety, and academic success. 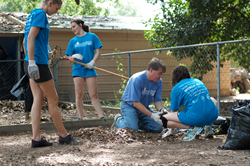 On Monday, August 25th, first-year students participated in the second annual World House Service Day, giving back to the Shreveport area through projects coordinated with Community Renewal International, the Fuller Center for Housing of NWLA, and Shreveport Green. Incoming Centenary students are matched to one of three World House residential communities that combine coursework and community service in an intentional response to a specific global challenge, as identified by the Centenary faculty: living a meaningful life, living a sustainable life, and expanding our circles of relationships. President Rowe will give first-year students their official welcome to the College on Thursday morning at the President’s Convocation, an annual event that this year features a special address by R. Owen Wilson, President of the Associated Colleges of the South. The first-year class will make the traditional walk into Brown Chapel to the sounds of applause and cheers from the Class of 2015. All graduating seniors make this same walk in the spring of their final year.